TGIF!!! Hi pretty ladies our review for today is about my new hair buddy. Right now I am still a blonde head and its really hard to comb my hair during the mornings. Washing my hair and drying it can be a pain especially every mornings. To make sure that my hair will not be a pile of mess later I use: J.TOMAS Hair Solutions' NO-TANGLE Leave in Hair Mist. J.TOMAS Hair Solutions' NO-TANGLE Leave in Hair Mist is a weightless, pre-styling instant conditioner that detangles hair without greasiness. I have naturally unruly dry hair, I only use big tooth comb to take care of my tresses. Ever since I've bleached my hair I know my mornings won't be the same again. I needed the help of conditioner and leave on to make my hair manageable. The last time I've used J.TOMAS Hair Solutions' NO-TANGLE Leave in Hair Mist was when I still have brown hair. I was wondering how it will fare on bleached hair? First thing, the scent is fresh and light. The liquid is grayish and the atomizer works really well. A few sprays on my hair makes it real easy to comb out. My hair is usually like rubber like when damp, however it is not the case with J.Tomas Hair Mist, although it doesn't give moisture it makes it real manageable. Its light and non sticky on my hair like I did not put on anything. It only works as it promised. It didn't weigh hair down but made it frizz free. If you have dry hair though you may still need to apply hair shine or something to make your hair look nice with sheen. Php 165 for a 100 ml bottle. It only comes in one size and it only lasted for a month with everyday use. I bought this at Watsons. Slightly damp hair is best time to use this hair mist, just spray it on and style as usual. 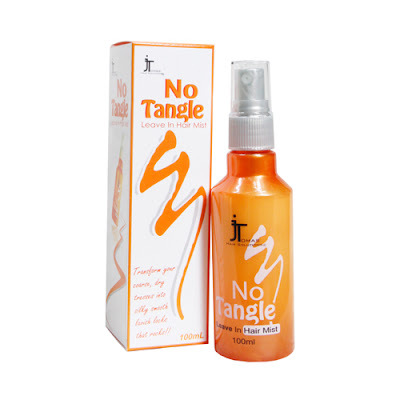 I recommend J.TOMAS Hair Solutions' NO-TANGLE Leave in Hair Mist for girls with unruly hair who doesn't want frizz on their every morning. Its affordable and simply works as promised.